Qube Café, the coffee shop at Siesta Hitech hotel at Kondapur has been recently organizing quite a few Indian regional food festivals. Their promotions have struck a chord with the food lovers of Hyderabad because they offer a very good spread at a budget price. I had tried out some of the food items from their Bengali food festival, and still remember how good the preparations were. 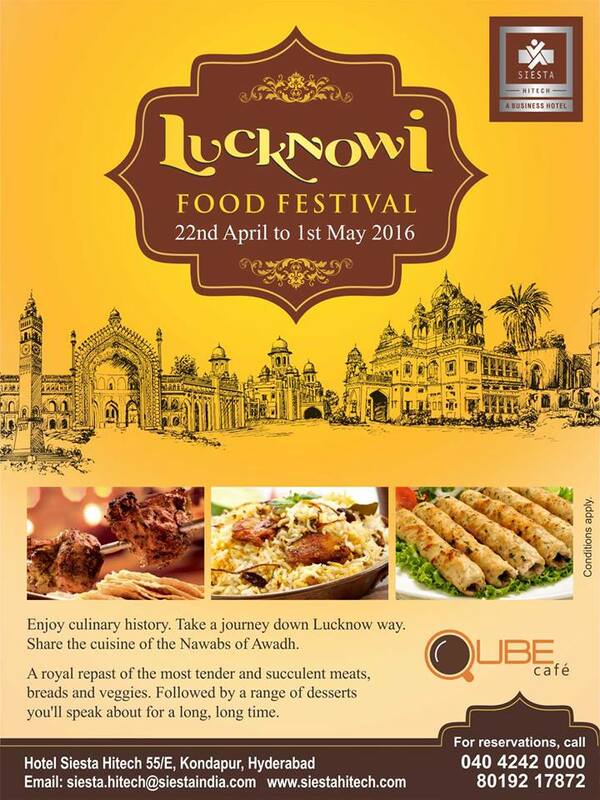 So this time, when I was invited to their Lucknowi Food Festival, I made it a point to attend the same. 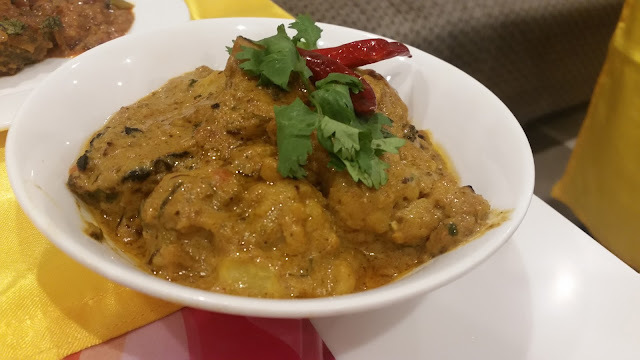 Unlike a few years ago, we now have quite a few restaurants offering Awadhi food in Hyderabad – Jashn-E-Audh, Tansen and Point Pleasant to name a few. 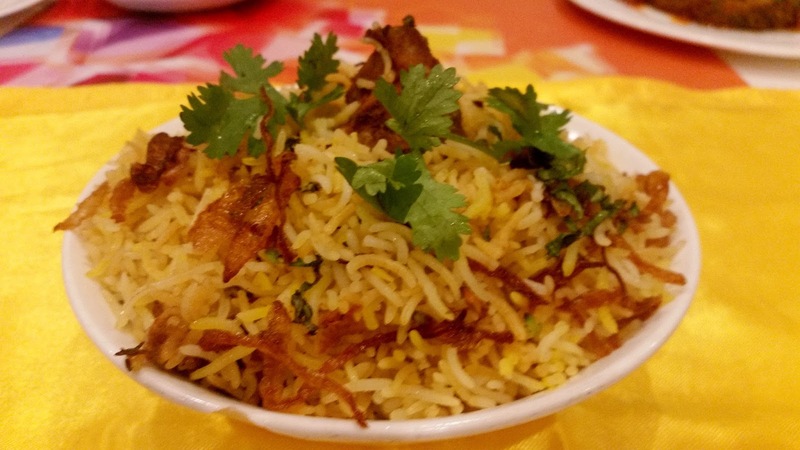 As a result, Hyderabadis are now much more familiar with the popular dishes of Awadhi cuisine. Qube Café has acknowledged that and they have gone beyond the usual dishes to present some of the less popular recipes from Lucknow. 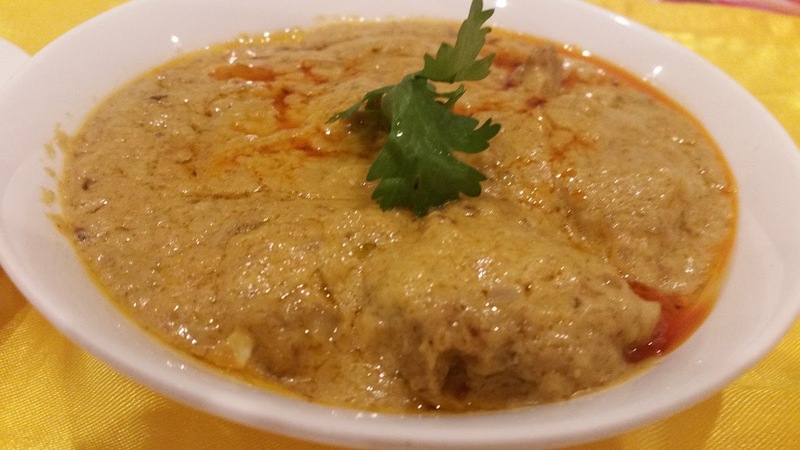 Naushahi Jaan was a kabab where one could see the mastery of the Chef Ram Chandra of Siesta. 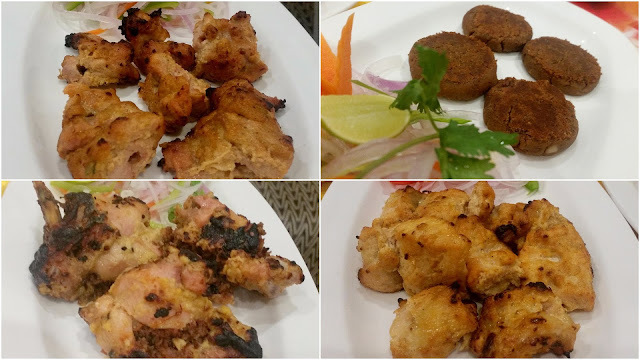 The succulent chicken kababs had minced mutton inside, giving it a delicious taste. 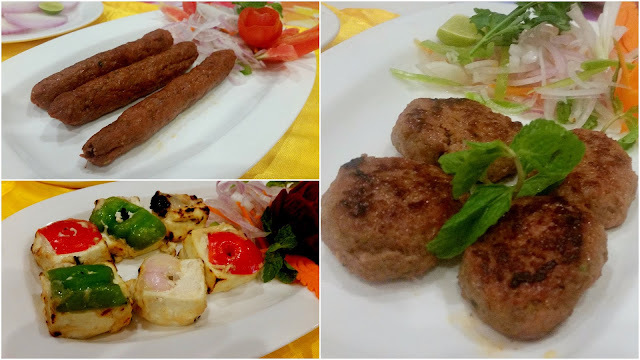 Kakori Kababs, which are supposed to be the softest version of skewered seekh kababs, as well as the signature dish of the cuisine, Galawati or melt-in-the-mouth kababs, were served with a delicious green chutney. The Bengali in me liked the touch of mustard in the marinade of the Mahi Tikka. The vegetarian kababs were interesting too. Rajma Ke Galawat was a variation of the soft kabab using rajma instead of mutton. Ulta Tawa Ka Paratha was served along with to enhance the taste of both the galawatis. I loved the taste of Kathal Ke Kabab, though the jackfruit was a tad too sweet. Badshahi Paneer Tikka, in a white malai marinade, was pretty decent too. The main courses spread was also quite huge – about ten items. My pick there was Keema and Mutter ke Zaika, a thick gravy with mutton mince and peas. The Murgh Masala Wajid Ali went well the Bakarkhani bread served with it. Mutton Qorma was another delicacy which I loved. Among the vegetarian spread, Gobi Musallam appealed to me for the tasty masala gravy it had. I rued the fact that I had over-gorged on starters and could not try out quite a few of the main courses. Still, I wanted to taste the Awadhi Mutton Biryani. The aroma was subtle, and the mutton was soft, but for me, the rice was too dry. I would have preferred a bit more ghee and a bit more flavours like kewra water in it. 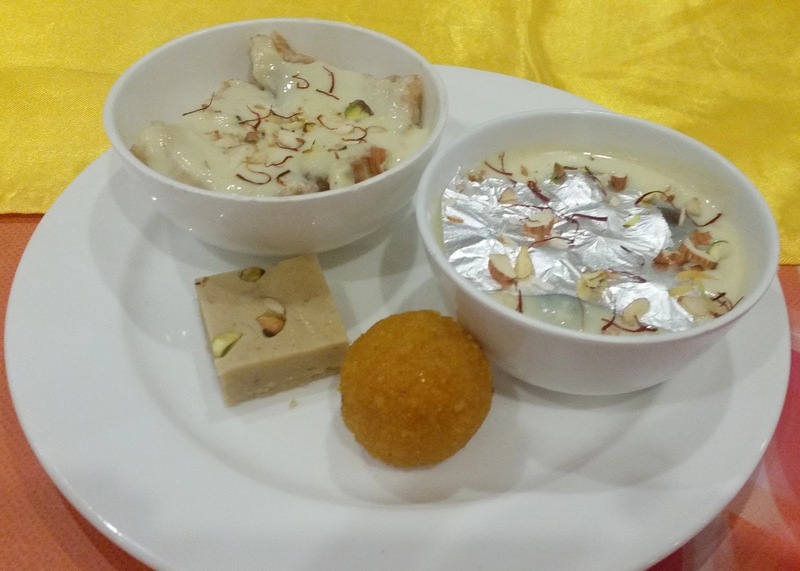 The desserts were very good – especially the Angoori Rabdi and Shahi Tukda. Motichur Laddu and Pista aur Badam Ki Barfi were the other two desserts served. The buffet also had a nice Lucknowi chaat counter, which I did not try. Around five varieties of salads were also on display. The promotion is on for dinner until May 1st at a value-for-money price of Rs 550. The pricing is a steal for such a huge spread, and the menu changes everyday to suit their regular diners. A good thing about the festival is the equal focus they have kept on vegetarian food also, normally these are ignored in Awadhi festivals. I hope that the restaurant keeps up the good work of hosting regional food festivals at affordable prices.